Do you love tasting new flavors and learning how to cook unusual, seasonal, local food? We can’t wait show you how to use foraged wild edible plants and mushrooms, plus homegrown garden produce in your own kitchen. You’ll learn to create sumptuous meals that will surprise and delight your taste buds. Food that you grow and forage is nothing like what you can buy in the grocery store. The quality, freshness and flavor of these seasonal treasures sets them apart. We’ve been gathering and cultivating nature’s bounty from the Southern Appalachian mountains for more than a decade, and we love to share our passion. Join us in April for our Wild Foods Hike. 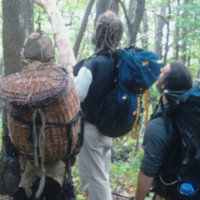 It’s a 3-day backpacking trip focused on identifying and wildcrafting edible plant in North Carolina. Every evening around a fire, we cook up what we’ve gathered during the day. This might be one of the only cooking classes that requires a sleeping bag! When it comes to plants, there is a fine line between food and medicine. Even herbs like parsley, basil and oregano have healing properties. If we incorporate healing herbs into our regular diet, they can help keep us healthy every day. In our wildcrafting class we teach how to make such healing delights as herbal pestos and medicinal vinegars, plus much more. This is a cooking class that brings the “farmacy” into the kitchen. We cover both wildcrafted and homegrown plants that support optimal health and wellness. The knowledge of healing foods and herbal medicines has long been held by women. Every year, we offer a special weekend of rewilding for women and the female-identified, where we come together to learn and remember this wisdom. 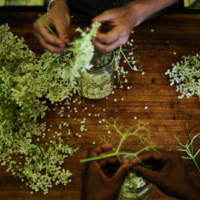 From drinking wildcrafted teas cooked over an open fire to preparing medicines to take home, this is a unique opportunity among cooking classes to connect deeply with our sustenance. Part of living permaculture is enjoying the natural abundance from the wilds and the garden. Lots of permaculture courses teach about growing and gathering food, but not all of them include cooking classes. Knowing how to cook tantalizing meals with what we can produce ourselves is a big part of achieving success with permaculture and sustainable living. It’s also crucial to be able to preserve the harvest for the wintertime. That’s why our Earthskills and Permaculture Certificate Course includes instruction not only on gardening and foraging, but also on cooking with wild and homegrown foods. In the fall, we dive into food preservation techniques such as drying, canning and root-cellaring. Taking it a step further, you could become a permaculture apprentice with us. Along with what we teach in classes, our apprentices learn invaluable “cooking” skills such as skinning and butchering animals for meat. Permaculture apprentices get to watch us in our food processing rhythms throughout the year. They come with us to gather what’s in season and learn in the same garden they help create and manage.